This tutorial has been updated for ChipWhisperer 4.0.0 release. If you are using 3.x.x see the "V3" link in the sidebar. This tutorial will take you through a complete attack on a software AES implementation. The specific implementation being attacked is a well-known AES implementation written in C, which is likely to be similar to other implementations used by proprietary systems. This tutorial runs on four different hardware targets. You only need to follow the steps for your given hardware. WARNING: This video was recorded with API V3.x, some changes happened so please take note. 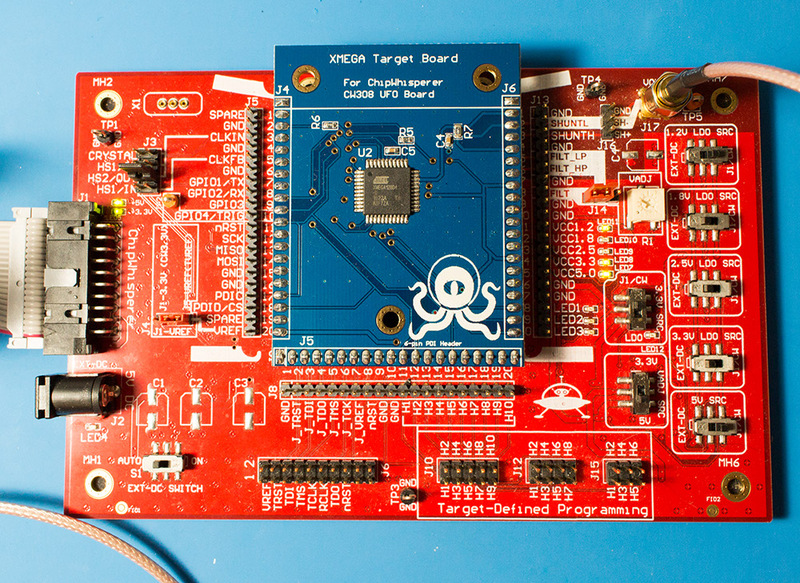 This tutorial uses the CW1200_ChipWhisperer-Pro hardware. Remove the ChipWhisperer-Pro main capture hardware, UFO Board, and SMA cable from the ChipWhisperer-Pro case. 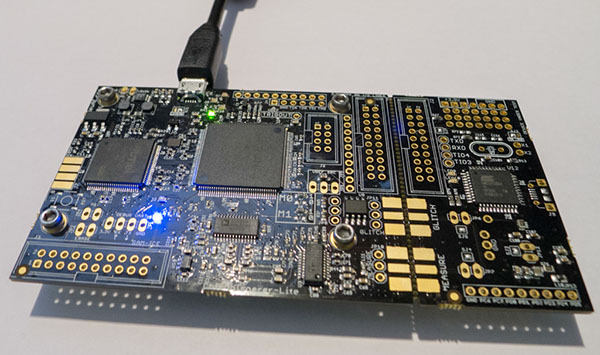 Attached the UFO board to the ChipWhisperer-Pro with the 20-pin cable, and connect the VOUT SMA connector to the MEASURE input. Power up the ChipWhisperer-Pro with the 5V DC power adapter, and connect the USB cable to the computer. If this the first time powering up, you will need to install the drivers (see CW1200_ChipWhisperer-Pro). "3.3V SRC" switch set to "J1/CW"
==== CW1200 (Pro) Hardware Setup ==== This tutorial uses the CW1200_ChipWhisperer-Pro hardware. ==== CW308 (UFO) Hardware Setup ==== Coming soon! Note that for this tutorial, you'll need to use the simpleserial-aes firmware. You'll need to have installed avr-gcc and avr-libc. You may have already done this by following the installation guide, or if using the ChipWhisperer-VM it comes prepared with avr-gcc already setup. See the Installing_ChipWhisperer guide for details. Once you have a working compiler (check by typing 'avr-gcc' at the command line - if using Windows you may need to setup a special batch file to provide you with a avr-gcc command prompt). We want to use the existing SimpleSerial firmware as a base for our project, but we don't want to edit the existing firmware. Instead, we'll make a new project with a copy of this firmware. 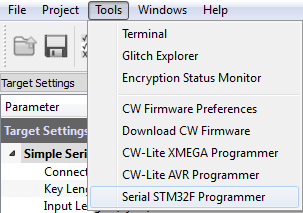 Copy the directory of the firmware you want to modify in the chipwhisperer/hardware/vicitims/firmware to a new folder. The folder you copy will depend on what tutorial you're doing. Typically, the firmware you want to use is listed above the "Building for ..." drop down menus in this wiki. The name is arbitrary, but for this example, we'll call it simpleserial-LAB-SPECIFIC-FOLDER (though depending on what firmware and tutorial you're working off of, you may want to call it something different). You must keep it in the same directory, as it will reference other files within that directory for the build process. Open a terminal with avr-gcc in the path. If using Windows the sidebar on the Installing_ChipWhisperer page - you can either add WinAVR to your system path, or you can run the 'winavr.bat' file suggested. Ensure that the "Built for platform ___" matches your target device. 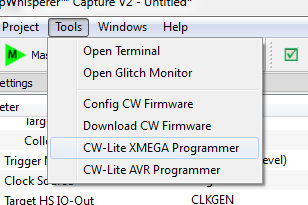 ==== Building for CWLite with XMEGA Target ==== You'll need to have installed avr-gcc and avr-libc. You may have already done this by following the installation guide, or if using the ChipWhisperer-VM it comes prepared with avr-gcc already setup. See the Installing_ChipWhisperer guide for details. You'll need to have installed the GNU Embedded Toolchain for ARM. If you haven't yet, see the Installing_ChipWhisperer guide, specifically the Installing ARM Toolchain section, for details. Once you have a working compiler (check by typing 'arm-none-eabi-gcc' at the command line). We want to use the existing SimpleSerial firmware as a base for our project, but we don't want to edit the existing firmware. Instead, we'll make a new project with a copy of this firmware. Copy the directory of the firmware you want to modify in the chipwhisperer/hardware/vicitims/firmware to a new folder. The folder you copy will depend on what tutorial you're doing. Typically, the firmware you want to use is listed above the "Building for ..." drop down menus in this tutorial. The name is arbitrary, but for this example, we'll call it simpleserial-LAB-SPECIFIC-FOLDER (though depending on what firmware and tutorial you're working off of, you may want to call it something different). You must keep it in the same directory, as it will reference other files within that directory for the build process. ==== Building for CWLite with Arm Target ==== You'll need to have installed the GNU Embedded Toolchain for ARM. If you haven't yet, see the Installing_ChipWhisperer guide, specifically the Installing ARM Toolchain section, for details. Building for other targets typically requires additional programs and tools. 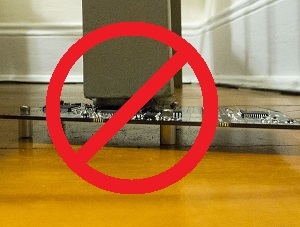 Additionally, some targets may have a unique build process, meaning the instructions here will not apply to them. Please see the page for the specific target you want to build for before following these instructions, which can be found under the Hardware Documentation section of the Main Page. We want to use the existing SimpleSerial firmware as a base for our project, but we don't want to edit the existing firmware. Instead, we'll make a new project with a copy of this firmware. Copy the directory of the firmware you want to modify in the chipwhisperer/hardware/vicitims/firmware to a new folder. The folder you copy will depend on what tutorial you're doing. Typically, the firmware you want to use is listed above the "Building for ..." drop down menus. The name is arbitrary, but for this example, we'll call it simpleserial-base-lab1 (though depending on what firmware and tutorial you're working off of, you may want to call it something different). You must keep it in the same directory, as it will reference other files within that directory for the build process. ==== Building for Other Targets ==== Building for other targets typically requires additional programs and tools. Additionally, some targets may have a unique build process, meaning the instructions here will not apply to them. Please see the page for the specific target you want to build for before following these instructions, which can be found under the Hardware Documentation section of the Main Page. 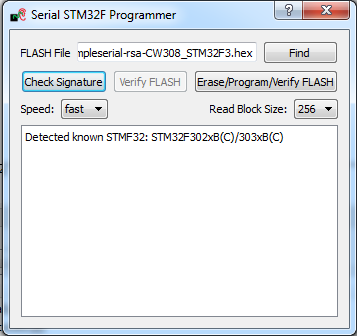 Note that for this tutorial, you'll need to use the simpleserial-aes firmware. We won't be modifying the firmware, so feel free to just build in the simpleserial-aes folder. It is assumed that you've already followed the guide in Installing_ChipWhisperer. Thus it is assumed you are able to communicate with the ChipWhisperer CW1173 hardware (or whatever capture hardware you are using). Note in particular you must have configured the FPGA bitstream in the ChipWhisperer-Capture software, all part of the description in the Installing_ChipWhisperer guide. Assuming this setup is complete, you can confirm you are able to communicate with the hardware by running the example capture of traces given in the CW1173_ChipWhisperer-Lite quick-start. Note with the XMEGA target, you need to configure a clock before programming of the device will succeed. Programming of the target device will be done as part of the CW-Capture software setup, discussed next. Switch to the Python Console tab. The script selection window (2) lists available example scripts. Scroll down to "connect_cwlite_simpleserial.py" and click on it. You will see the script contents appear in the "Script Preview" window (3). You can either hit the "Run" button or double-click the filename of the script to execute it. Do either of those now. The console lists the exact script that is executed. Note you could have manually executed the script commands line-by-line in this console. The "Scope" and "Target" buttons will show as connected. The Status Bar will show a connection. Note in previous software versions, this tutorial took you through manual setup. This can still be done (using the GUI), but instead now the API has been made more powerful, so the example configuration script will be used instead. Line 2: Sets the number of samples to record as 3000 samples long (this is normally used for the AES algorithm). Line 3: Sets an offset of 1250 samples from the trigger to when we start recording samples. Line 4: Sets the trigger as being a "rising edge" trigger. Line 7: Sets the trigger pin as GPIO4 (we previously set the trigger condition as rising edge, so this pin will be the one a rising edge is expected on). Line 8: Configures GPIO1 as the RX (Input). This is what the XMEGA target expects. Line 9: Configures GPIO2 as the TX (Output). This is what the XMEGA target expects. Line 10: Sets the "High-Speed 2" (HS2) pin as having the 7.37MHz clock output. Hit the Check Signature button and confirm the device is detected. If not you may have issues with the clock setup. 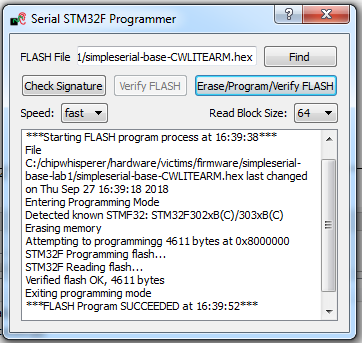 Note the programmer dialog not only shows the successful programming status, but also shows when the .hex file was last modified. Always confirm this matches with when you last remember compiling the program -- if it is widely different this suggests you have selected the wrong file! You can now close the programming dialog if you'd like. If you're frequently reprogramming the target, you may want to leave this open. 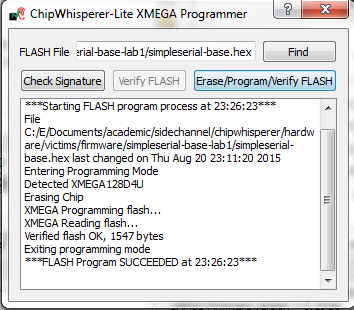 ==== Programming the XMEGA Target ==== It is assumed that you've already followed the guide in Installing_ChipWhisperer. Thus it is assumed you are able to communicate with the ChipWhisperer CW1173 hardware (or whatever capture hardware you are using). Note in particular you must have configured the FPGA bitstream in the ChipWhisperer-Capture software, all part of the description in the Installing_ChipWhisperer guide. Note with the CW303 Arm target, you need to configure a clock before programming of the device will succeed. Programming of the target device will be done as part of the CW-Capture software setup, discussed next. Line 2: Sets the number of samples to record as 5000 samples long (this is normally used for the AES algorithm). Line 3: Sets an offset of 0 samples from the trigger to when we start recording samples. Line 8: Configures GPIO1 as the RX (Input). This is what the ARM target expects. Line 9: Configures GPIO2 as the TX (Output). This is what the ARM target expects. Line 12: Sets the serial communication speed with the target at 38400 baud. If the software freezes and the verification fails after a long period of time, set the Read Block Size to 64 instead of 256. If you'd like, you can close the STM32F programmer dialog. If you frequently reprogram the target, you may want to leave it open. ==== Programming the STM32F3 (CW303 Arm) Target ==== It is assumed that you've already followed the guide in Installing_ChipWhisperer. Thus it is assumed you are able to communicate with the ChipWhisperer CW1173 hardware (or whatever capture hardware you are using). Note in particular you must have configured the FPGA bitstream in the ChipWhisperer-Capture software, all part of the description in the Installing_ChipWhisperer guide. Programming other targets typically requires additional tools, such as a target specific programmer or debugger. Please see the wiki page for your target for additional details. Additionally, you should run connect_simpleserial.py and the associated setup_*.py script before moving on to the rest of the tutorial. ==== Programming Other Targets ==== Programming other targets typically requires additional tools, such as a target specific programmer or debugger. Please see the wiki page for your target for additional details. Additionally, you should run connect_simpleserial.py and the associated setup_*.py script before moving on to the rest of the tutorial. 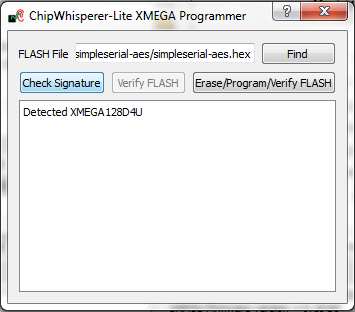 To do so, simply scroll down and select the "setup_cwlite_xmega_aes.py" if you're using the CW303 XMEGA target. If you're using the CW303 Arm target, select "setup_cwlite_stm32f_aes.py". If you're using another target, use the setup script for that target (such as setup_cw308_esp32.py). Additionally, try capturing a trace and seeing how long the "Trigger Active Count" field is under trigger setup. This will set an upper bound on how big "Total Samples" should be (since the AES is completed by this point). Reducing "Total Samples" will give better correlation and take less time to capture and analyze, but lowering it too much will miss the operations we're interest in! If your target lacks a script, "setup_cwlite_stm32f_aes.py" will probably work, but you should check the wiki page for your target to make sure there aren't any differences. If you wish to change the number of traces, do so here. The default of 50 should be sufficient to break AES for most targets though! Hit the Capture Many button (M in a green triangle) to start the capture process. You will see each new trace plotted in the waveform display. You'll see the trace count in the status bar. Once it says Trace 50 done (assuming you requested 50 traces) the capture process is complete. Finally save this project using the File --> Save Project option, give it any name you want. From the File --> Open Project option, navigate to the .cwp file you save previously. Open this file. 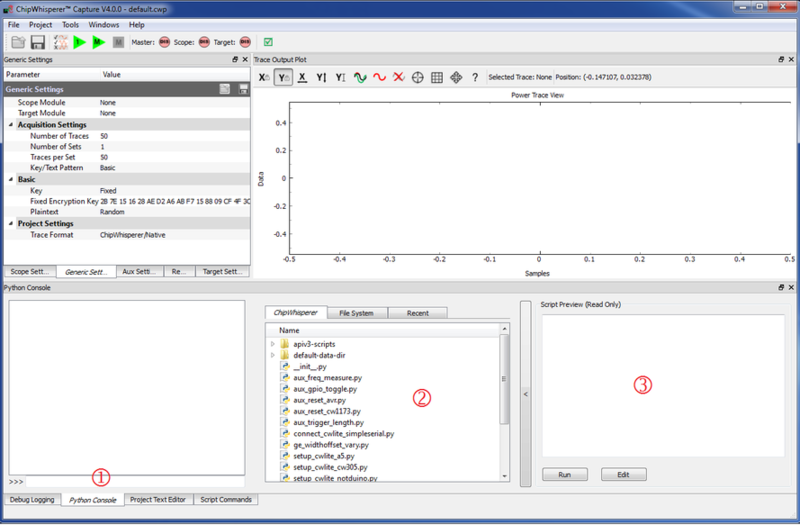 Switch to the Trace Output Plot tab on the right side. You can choose to plot a specific range of traces. 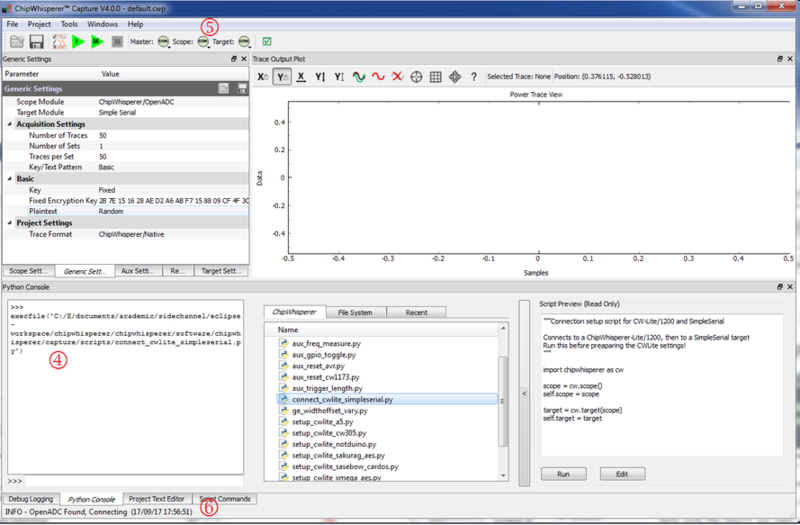 For example type 0-10 in the Trace(s) to plot window. 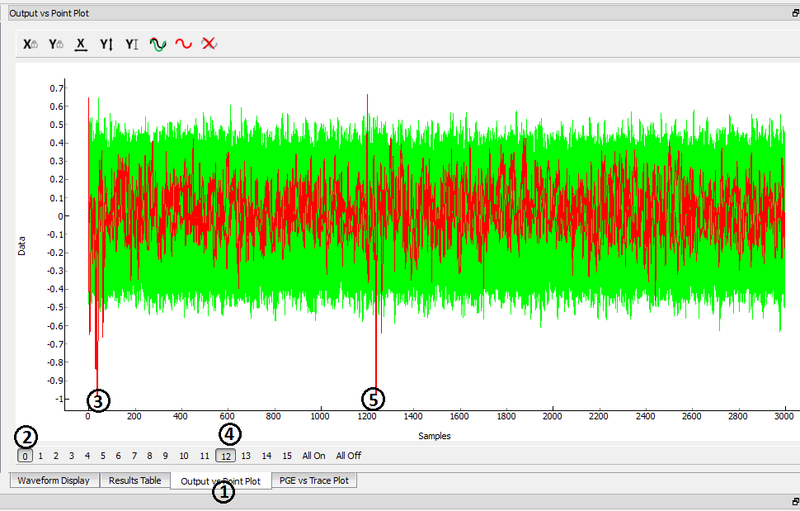 Hit the Redraw button when you change the trace plot range. You can right-click on the waveform to change options, or left-click and drag to zoom. Use the toolbar to quickly reset the zoom back to original. Try more advanced plotting options, like 0(r),4-7(b) to plot trace 0 in red, and 4-6 in blue. See a full list of possible commands on the page Plotting_Widget. #Example: If you wanted to add noise, turn the .enabled to "True"
Loading of project (if using a project from disk) & setting of trace information. Connecting output (drawing) widgets to the attack. If you need to modify the script, you can edit the file in an external editor. You will need to ensure your system is configured to open your preferred editor on ".py" files, OR configure the editor under Help --> Preferences. The default options should work, but you can modify for example the Reporting Interval to see more detailed graphs. Turn on one of the bytes to see results. The known correct guess for the key is highlighted in red. The wrong guesses are plotted in green. You can see that the attacked operation appeared to occur around sample 40 for key 0. Remember you can click-drag to zoom in, then right-click and select View All to zoom back out. Turn on another byte to see results for it. This byte occured much later - sample 1240. By exploring where the maximum correlation was found for the correct key-guess of each byte, you can determine where exactly the attacked operation occured. This has only briefly outlined how to perform a CPA attack. You can move onto more advanced tutorials, especially showing you how the actual attack works when performed manually. 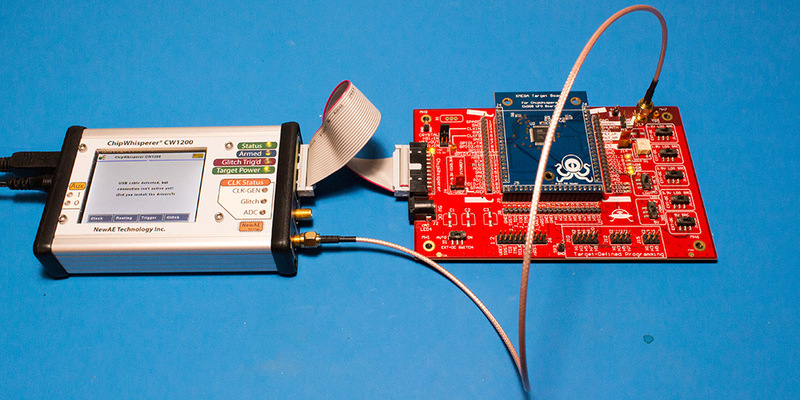 This tutorial also utilized tiny-AES128-C for Arm targets, which uses the same operations as the XMEGA target. For a more typical 32 bit AES attack, see Tutorial A8 32bit AES.